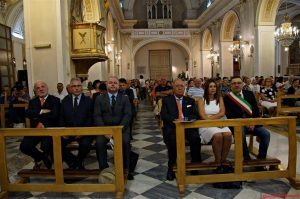 Home » Regimental Association » Memorial Plaque Unveiling in Piedimonte Etneo. Memorial Plaque Unveiling in Piedimonte Etneo. By Richard O'Sullivan in Regimental Association, Regimental History, Second World War on September 14, 2018 . 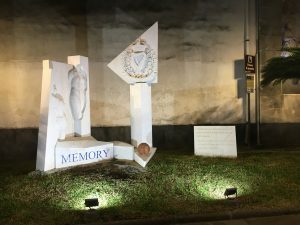 The Regimental Association was honoured to attend a Commemorative event in the town of Piedimonte Etneo on the north eastern slopes of Mt Etna that took place on the exact 75th anniversary of the date when men of the 1st Battalion, London Irish Rifles entered the town in early September 1943. 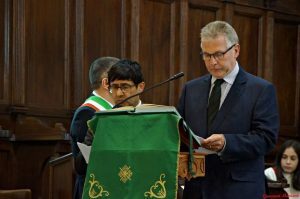 The Chairman, Peter Lough, and Association Members Richard and Edmund O’Sullivan, whose father served with the 2nd Battalion in Sicily, attended a Service of Remembrance at the town’s Chiesa Madre before a marble plaque was blessed by the parish priest, Dom Mario, outside the church. 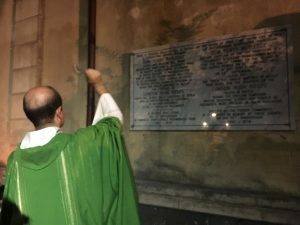 The plaque honours the memory of the 90 members of London Irish Rifles and numerous Sicilians civilians who died during the fighting on the island. The 1st Battalion London Irish Rifles would stay in Piedimonte for over a month from 8th September to 10th October 1943 when they en-shipped for Naples. 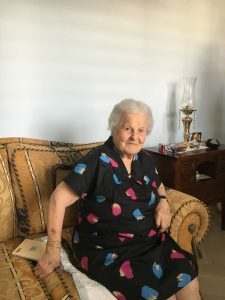 A witness to the events of 1943, Angelina Vitale, was on hand to tell us of the day when she and her family welcomed the London Irish into her home town as liberators and garlanded them with flowers. It is really quite remarkable, that in a small town in Sicily, there are now two memorials dedicated to the men of the London Irish Rifles – entirely funded by the local townspeople. 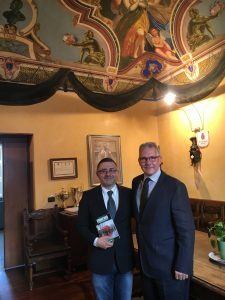 Thank you so much to Dom Mario, Mayor Ignazio Puglisi, Deputy Mayor Giuseppe Pagano, the President and Members of the Town Council and all the townspeople of Piedimonte Etneo for their fantastic welcome. I am delighted to visit your lovely town again.This is my third visit here to Piedimonte and I would like to thank you all for your usual most hospitable welcome. Today’s commemorative event is a truly remarkable one for our Regimental Association. 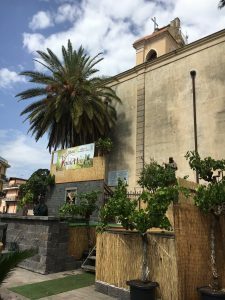 As you know, 75 years ago this week, the 1st Battalion of the London Irish Rifles arrived in this town after a very difficult period when they were embattled on the east coast of Sicily during July and early August of 1943. On 8th September 1943, the men of the London Irish Rifles moved from the coastal area near Fiumefreddo to the cooler climes of this town. It was a very welcome move and it is perhaps not surprising that our Regimental history stated that: “Piedimonte was the most comfortable place that the Battalion had stayed at since leaving England in August 1942…” Some of you will remember that day when London Irish Riflemen, wearing what some of you thought were “orange skirts”, entered the town – I can certainly see Angelina, who did indeed witness the historic events of that day. Two weeks after the London Irish Rifles arrived, a Parade and Service of Remembrance was held here in the town to commemorate one of our Regiment’s most famous battles during the Great War: the Battle of Loos that took place in northern France. The Commanding Officer of the 1st Battalion London Irish Rifles, Lt-Colonel Ian Good, addressed the parade in Piedimonte that day. Our Regimental records noted that after the parade: “the Battalion marched to their respective services, both Roman Catholic and Anglican, which were held for the remembrance of men of the Battalion who fell in the battle of Loos and for those who fell in the fighting in Sicily.” One of the services, held here at this church at that time, was conducted by Father Denys Rutledge, along with our own battalion’s padre, Father Treacy. At this point, I would like to reflect on the memories of those desperately difficult days in September 1943. Both the Riflemen and the people of Sicily had suffered so much over the previous months, and it was quite fantastic that they could all come together in fraternal friendship during the 5 weeks that the town of Piedimonte hosted their visitors. 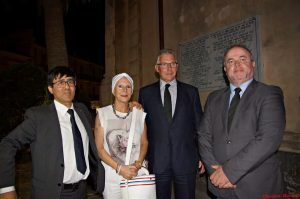 I am sure that the moments of deep prayer and solemn contemplation and reflection were directed to both the military combatants of all countries and the civilians of Sicily, who were sadly caught up in the fighting on the island. I am also sure that the events of the day would have been of great spiritual comfort to everyone and would indeed contribute greatly towards a continuing period of close mutual friendship in the town until the London Irish reluctantly left Piedimonte on the 10th October. As I say, 25th September 1943 was a most important day of reflective contemplation that has been mirrored at the Service of Remembrance here today. It is a most remarkable thing that I can now look out across to your own War Memorial marking the sacrifices of the Great War, the Memorial that is dedicated to men of the London Irish Rifles and can also stand close to the Commemorative Plaque.